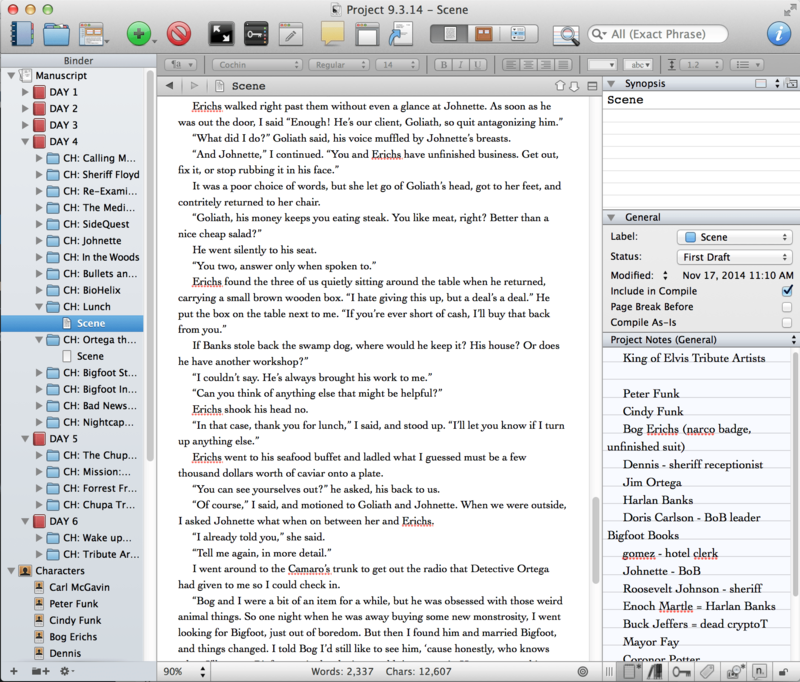 Like a lot of writers, Scrivener is my go to app for writing. There simply is no better way to write and manage a long project like a novel. Unlike traditional text editors like Word or Pages, Scrivener is a binder of individual text documents. The way I use it, each scene in a chapter is a unique file. It’s an approach I first encountered back with the first version of Ulysses, which is now in it’s third version, but was perfected (for me at least) by Scrivener. Although I have to admit I haven’t played with Ulysses III yet. But the problem with Scrivener is that I have been waiting for YEARS for an iPad version of the app. “It’s coming,” they say, and I believe them, but I have a novel to write, right now. For the sequel to Elvis Sightings, I considered switching to Storyist. It has a Mac and iPad version that can sync files back and forth to each other, so it makes cross platform writing pretty easy. I played with the Mac version of the software, and while it approximates maybe 70% of the writing experience of Scrivener, that missing 30% was too much for me, so I was back to no iPad solution. Sort of. Since Scrivener 2.0 was released, it’s had the ability to sync with Simplenote, a plain text editor that works across platforms and is free, thanks to the people at Automatic, the same people who create the software this site runs on. The sync process is pretty easy, but because Scrivener has this funky file format, what you get in Simplenote is a jumble of files with messed up names – and you have to ingest the whole Scrivener project which could be hundreds of files in my case, making using the app for anything else pretty painful. 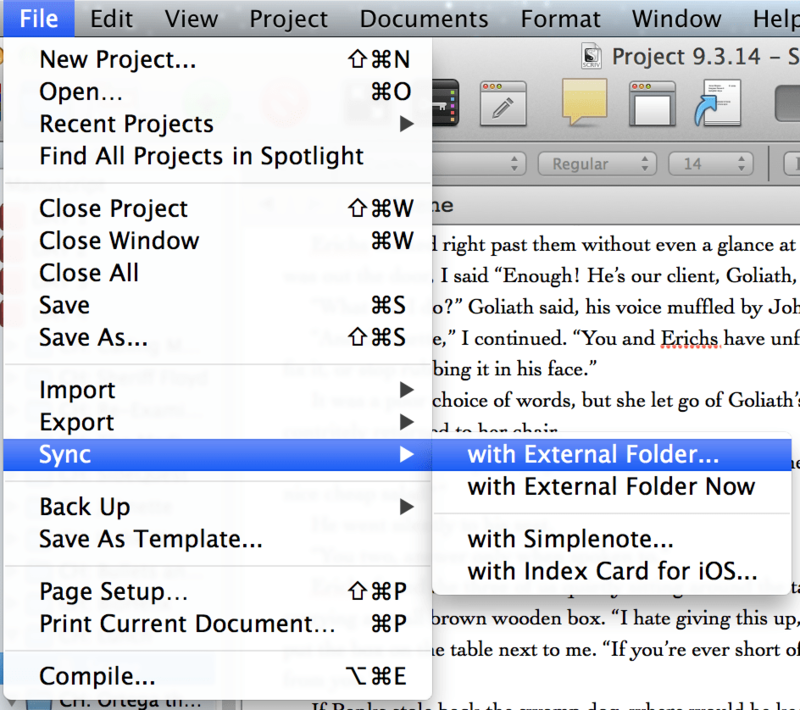 Scrivener also has the ability to sync it’s text files to an external folder. Another long time feature. I’d been resisting it until now, but once I finally used it, I discovered it wasn’t nearly as awful as using Simplenote, even if it wasn’t as clean as I’d like. The way it works, you pick an external folder in your Dropbox, and Scrivener dumps all your designated text files into the folder. You can then use a Dropbox text editor, like Byword or iA Writer, to open the files on your iPad. Much cleaner than using Simplenote, as you only open the specific file you want to work on. Both Byword and Writer have iPad/Mac native apps. 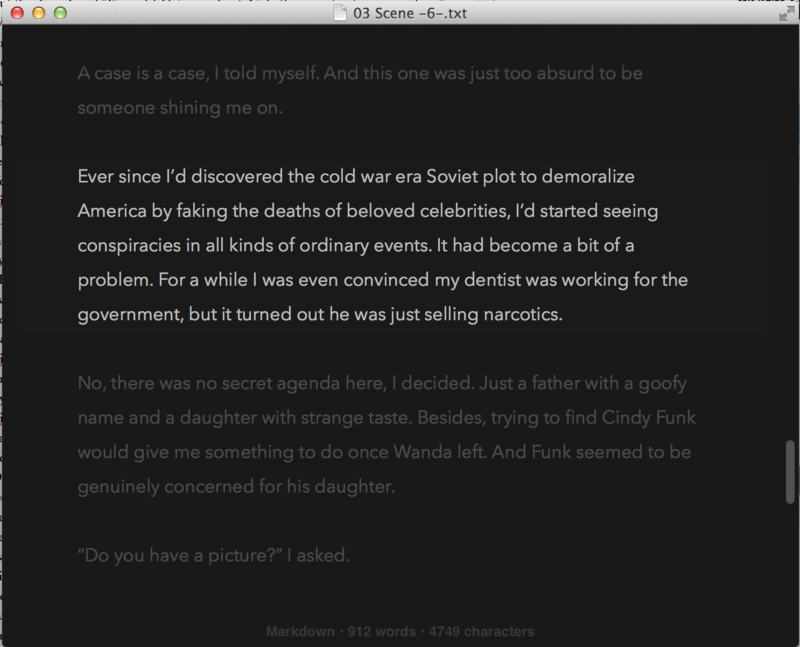 I ultimately ended up choosing Byword for my iPad writing app. The two apps are pretty similar, but I liked the way Byword does file management and I was interested in Byword’s ability to publish to WordPress. It’s an extra fee, but I’d been looking for a better blog writing environment than the somewhat buggy WordPress app and the web interface. The feature is somewhat spartan at the moment, but it’s a good way to get a draft onto the server, that you can finish up using the native interface. I’m late to the party in discussing how to move Scrivener projects to the iPad and back, but the upside for me is this process is already pretty well baked and bug free. My recommendation if you want to write on iPad and Mac, and be able to use Scrivener, is to use Byword via Dropbox. It’s not perfect, but it will do until the iPad version of Scrivener comes out.